Then he found South Canterbury, in the world’s most peaceful place to live in, New Zealand. 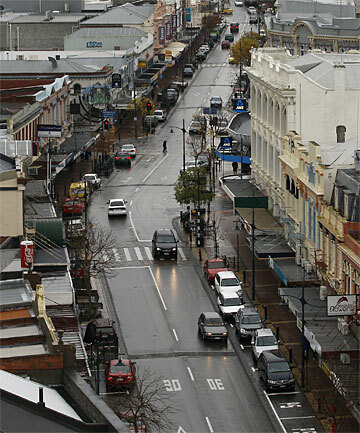 South Canterbury reminds him of Iloilo; a fusion of a quiet life in the rural and the progressive life in the urban. “It’s like a rural town in the Philippines with first class amenities, low traffic volume, fewer people and relaxed atmosphere,” he said. Even the old colonial buildings along Stafford Street would remind you of Iloilo City’s Calle Real, he added. Apart from being home to scenic spots, the place is also perfect for those with temper for insects. Why? Jonan said that since August last year, he never saw any cockroach, rat and even ants crawling on sugar or sweets. “Migrating to New Zealand and moving to South Canterbury is one great journey for our family,” he shared. His blog has testimonies of faith, hope and love with the prayer that those who read it will be inspired to go on with life and move forward despite difficult circumstances. Lucky that NZ is a democratic country, Jonan was also able to continue sharing the same faith with his fellow Filipinos at JIL Life Group and Kiwi friends at Wilson Street Baptist Church. JIL Life Group Filipinos attending the South Canterbury Association of Filipinos Christmas party in December 2012. Meeting Filipino dairy farm workers having picnic at Caroline Bay Park. Compared to other areas in the world, the number of Filipinos in South Canterbury remains minimal. I see three types of Filipino migrants here in South Canterbury – Filipinas who married a Kiwi, OFW (overseas Filipino worker) on a work contract and Filipino professionals who migrated singly or with their family members. Known for its vast pasture, there are also lots of Filipinos manning the dairy farms. Others work as labourers in big factories for potato processing and farm products packaging. In the last quarter of 2012, there were 22 Filipinos who arrived to layout fiber optics cables in Timaru. There are also a few working in information technology jobs, administrative, health and social services. Filipinos fishing at nearby Caroline Bay Port. South Canterbury is migrant-friendly. The NZ government has instituted the Citizens Advice Bureau to help her citizens including new migrants for common settlement issues. Organized in almost every suburb, they have free seminars and orientation for newcomers. All you need to do is visit their office, enquire and enlist in the programs they are offering for new migrants. Those who wanted to visit or live in South Canterbury must apply through the Immigration New Zealand. Each year, the Caroline Bay Carnival offers a week-long evening of concerts and entertainment for Timaruvians. Just like Filipinos, Jonan said that Kiwi people also greet each other on the streets. “Besides meeting and getting-to-know us, they offered help if you need one. Because of that, we feel at home and it’s like we’ve been here for a long time already,” he said. He also admired how the Kiwis respect their government system. While security in Philippine malls remains questionable, in New Zealand, there is no single security guard in malls and even in banks. Aside from obedience of the law, Filipino values like “palabra de honor” and honesty are also practiced by the Kiwis. The board walk at Caroline Bay is a beautiful place to walk through while enjoying the very relaxing view at any time on a sunny day. Karen Bermejo is a Filipino journalist, writing for The News Today, a local newspaper based in Iloilo City circulating in Western Visayas. She also writes for the Philippine Daily Inquirer. She hopes to inspire people through her column “En Route”, which features stories of success, struggle and opportunity for Filipinos living, working and aspiring to go abroad. Karen’s article “Finding Peace in South Canterbury” appeared on The News Today Libre 22 February 2013 edition. From Worry To Glory added some photos to enhance this blog post.